I know envy is a bad feeling but I swear this is a good envy ok? 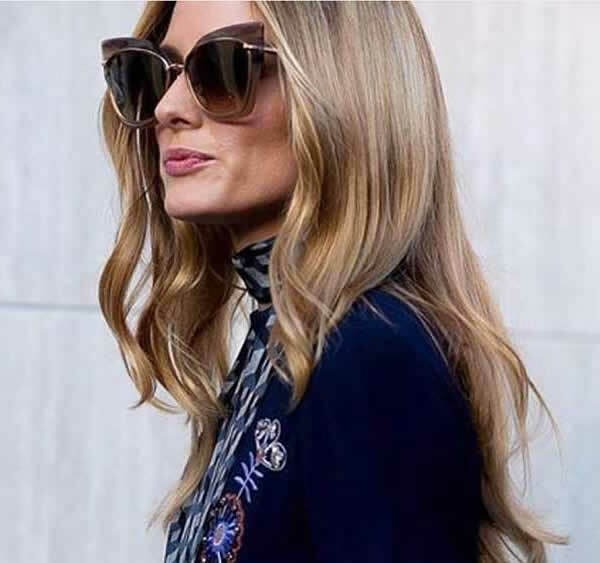 The truth is that I really do envy all Olivia Palermo’s sunglasses. I was looking at some street style pictures of her and I was thinking what a great collection she has, every look is perfectly accessorized with a pair of awesome sunglasses and all shades looks good on her face shape. I’m a huge fan of sunglasses, my most expensive pair I guess it was a Celine one, but I’ve done some craziness buying Christin Dior or Miu Miu that are brands that to me are considered top high brands. Anyway when I look at those pairs, even if I don’t wear them as much as I should, I think it’s like having a little piece of art. Off course my sunglasses collection is far for being like Olivia’s so check some of these awesome pictures of the famous it girl and her huge collection of shades. Eu sei que é feio sentir inveja mas juro que é inveja boa! Afinal é só uma pequena inveja da vasta colecção de óculos de Sol da Olivia Palermo. Estava a ver uma série de fotografias de street style e dei comigo a pensar em como a Olivia em qualquer look que fotografa, combina super bem os óculos de sol, e ainda por cima todos os modelos lhe ficam bem na cara, o que nem sempre é fácil por mais bonita que se seja. Eu sou uma fanática de óculos de sol, adoro e sou capaz de perder a cabeça por um modelo que me fascine. Acho que até hoje os mais caros foram uns óculos Celine, mas também já perdi a cabeça por uns Christian Dior e uns Miu Miu, que para mim já são marcas acima daquilo que estou habituada a comprar. Mas não me arrependo, porque mesmo não usando talvez tanto como deveria, quando olho para eles são como pequenas peças de arte. Love all of the sunglasses here! Ok now I envying her too! Her sunglasses collection truly is incredible! Ohhh yeah, she can rock any pair of sunglasses. Love this! She has so many beautiful sunglasses! A great selection! I like the style of Olivia, it's always flawlessly chosen accessories. I love sunglasses, my favourite is the last pair, so beautiful! The sunglasses are really amazing! Me ha encantado el post!! Ideales todas las gafas!! What a collection - beautiful!! LOVE the sunglasses, its hard to choose only one favorite!